Kennedy, Dorothy and Randy Bouchard. "Interior Salish". The Canadian Encyclopedia, 16 October 2018, Historica Canada. https://www.thecanadianencyclopedia.ca/en/article/interior-salish-first-nations. Accessed 19 April 2019. Interior Salish comprise Lillooet, Shuswap (now Secwepemc), Thompson (now Nlaka'pamux) and Okanagan are the four First Nation groups in the interior of British Columbia (although Okanagan territory extends into Washington state) who speak languages belonging to the Interior Salish division of the Salishan language family. Seated human figure bowl, soapstone, from near Kamloops, BC, prehistoric Interior Salish (courtesy Provincial Museum of BC, Victoria). Lillooet are divided into two main groups linguistically, culturally and geographically - Upper or Fraser River Lillooet, mainly in the vicinity of the town of Lillooet on the Fraser River, and Lower or Mount Currie Lillooet, mainly around the community of Mount Currie in the Pemberton Valley and extending south to Skookumchuk. Use of the word "Lillooet" is confusing, as the term actually applies to the Mount Currie people only, who call themselves LEEL'-wat-OOL' ("the real, original Lillooet"). The Fraser River Lillooet people refer to themselves as STLA'-tlei-mu-wh. They and the Mount Currie people speak slightly different dialects of the same language, known in English as "Lillooet." A third group of Lillooet are the Lakes Lillooet who live in the vicinity of Seton and Anderson lakes, situated midway between Upper and Lower Lillooet territory. The Lillooet belong to the Plateau culture area, although the Lower Lillooet were strongly influenced by adjacent Northwest Coast cultures. In 1996, there were 2547 Lillooet living on reserves ranging from Skookumchuck and Mount Currie to Anderson Lake and Seton Lake and from Lillooet, Bridge River and Fountain up the Fraser River as far as Pavilion (which was a Shuswap village until the early 1900s). Another 2194 Lillooet lived off-reserve. Just north of the town of Lillooet is the largest late 20th-century Aboriginal fishery on the Fraser River. 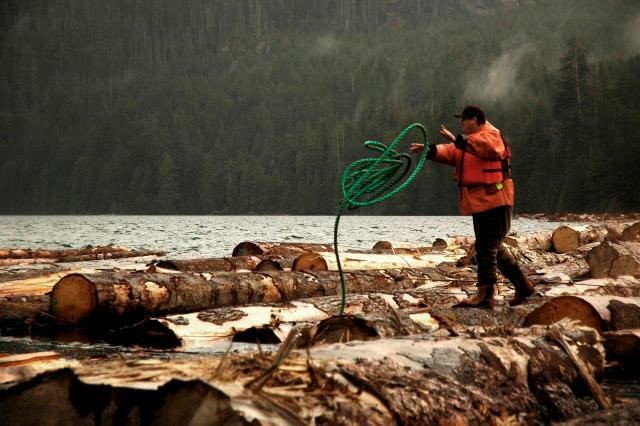 Every summer, hundreds of Aboriginal people gather to dip-net sockeye salmon from the turbulent waters. The fish are filleted and hung on covered racks to dry in the warm winds. Aboriginal people throughout BC and Washington State travel to Lillooet to barter for this delicacy. The term "Shuswap" is an Anglicization of the Aboriginal word these people call themselves and transcribed today as Secwepemc. The Shuswap are the northernmost Interior Salish group of the Plateau culture area. Formerly their territory was vast, extending from the Rocky Mountains in the east to the Fraser River in the west, and ranging from Williams Lake in the north to Armstrong in the south. Shuswap villages are located near the numerous lakes in their territory and in the valleys of the North and South Thompson rivers and their tributaries, as well as along the Fraser River. Today about half of the 7945 Shuswap live on reserves throughout this large area. Although the Thompson refer to themselves by the Aboriginal term in-thla-CAP'-mu-wh (sometimes spelled "Ntlakapamux"), they have come to be known as Thompson, after the name of the river that flows through their territory. They are divided into two main groups: Lower Thompson, extending along the Fraser River canyon from just south of Lytton to an area just south of Spuzzum; and Upper Thompson, consisting of four subgroups in an area extending from Lytton and up the Fraser River to about 20 km below Lillooet, and including the Thompson River drainage system from its mouth upriver to Ashcroft, and the Nicola River drainage, including a large area around Merritt. Originally the Merritt and Nicola rivers area had been occupied by the Nicola-Similkameen Dene, but by the late 1800s Thompson and Okanagan had taken over their territory. Today there are approximately half of the 5682 Thompson living on reserves throughout this territory, but centered mostly in Lytton and Merritt. The Interior Salish living in the Okanagan Valley and along the Similkameen River are known as Okanagan, although they form part of a larger group now known as "Okanagan-Colville" by some linguists and anthropologists. Okanagan-Colville territory occupies 72 500 km2 in south-central BC (70%) and northeast Washington state (30%). 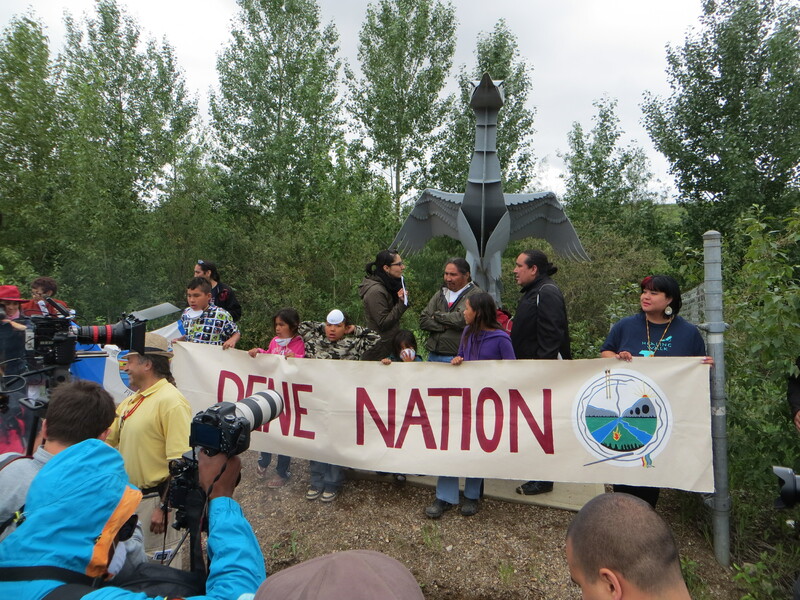 The Aboriginal term n-seel-ick-CHEEN refers to all those people who speak the Okanagan-Colville language. In BC this language is known in English as "Okanagan," and in Washington state it is most often called "Colville." There are seven dialect divisions of the Okanagan-Colville language, of which three are (or were, in the case of "Lakes") in BC. "Northern Okanagan" refers to the dialect spoken by Aboriginals living in the vicinity of Okanagan Lake and along the Okanagan River drainage system, and "Similkameen Okanagan" refers to the dialect spoken by Aboriginals living along the Similkameen River (territory formerly occupied by the Nicola-Similkameen Athapaskans). The "Lakes" dialect was formerly spoken by those Aboriginals living along the Upper and Lower Arrow lakes, but by about 1870 these people had moved south across the border and were later allotted land on the Colville Aboriginal Reservation. In 1996 of a total population of 3575, there were 2178 Okanagan living on reserves near Vernon, Westbank, Penticton, Keremeos and Oliver. Lillooet, Shuswap, Thomson and Okanagan subsistence was based on a combination of fishing, hunting and gathering of plant foods. The quest for food was regimented by an annual cycle that took groups of people to various localities, the choice of which was determined by the availability of resources. During the winter months Interior Salish lived in villages consisting of clustered semisubterranean dwellings known as pit houses. Here they existed on the provisions they had prepared and preserved at other times of the year. These pit houses were constructed in circular or squarish holes dug about 2 m deep and about 8 m in diameter. The rafters forming the conical roof of each pit house were thickly insulated with earth and grass to protect the people inside from the cold. Sometimes rectangular or conical tule-mat lodges were used as winter homes by the Interior Salish, but such dwellings were most often used during warmer months. 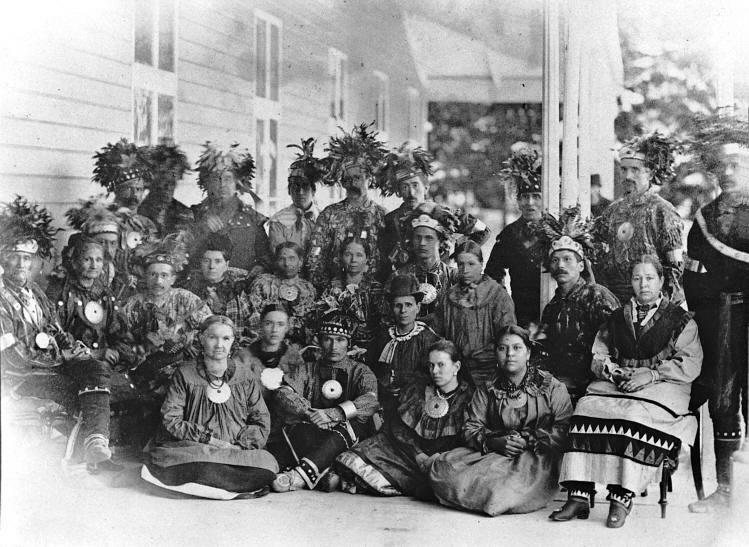 The basic political unit of Interior Salish society, the village, was governed communally. Within each village there were a number of leaders or chiefs known for their proficiency in such skills as fishing, hunting, war or oratory. However, all adult males had the same rights and responsibilities and took part in decision making. Men and women had clearly defined roles: men hunted, fished and manufactured tools from bone, wood and stone; women prepared food, wove baskets and mats, tanned animal hides for clothes, and looked after small children. As preparation for adulthood, each child underwent a "vision quest" by training alone in the mountains to receive a guardian spirit power. Such spirit power guided and protected initiates throughout their lives and gave them special skills or supernatural strength or vision. Some guardian spirits were more powerful than others, bestowing upon the receiver the ability, for example, to heal the sick. Every year, through special songs and dances during winter ceremonials, the relationship with guardian spirits was renewed. The first contact that Interior Salish had with Europeans occurred in 1793 when Alexander Mackenzie made his overland journey to the Pacific and met groups of Shuswap near the northernmost extremities of their territory. In 1808, when Simon Fraser descended the river later named after him, he encountered Shuswap, Lillooet and Thompson. The first encounter of Okanagan-speaking First Nations in BC with Europeans took place in 1811 in the Arrow Lakes area, when David David Thompson, an explorer for the North West Company, was searching for new supplies of furs. A few large reserves, established during BC's colonial period, were reduced significantly after Confederation. In the 1870s, Interior Salish lands were surveyed, Aboriginal reserves were established, and the land claims dispute (which continues to the present time) began. Out of the struggle for recognition of Aboriginal rights, there emerged several prominent Interior Salish leaders, notably Chief Michelle of the Thompson, Chief Chillihitza of the Okanagan, Chief David of the Shuswap and, most recently, Chief George Manuel, also a Shuswap. See also general articles under Aboriginal People. R. Bouchard and D. Kennedy, Lillooet Stories (1977); D. Hanna and M. Henry, Our Tellings (1995); C. Hill-Tout, The Salish People, 4 vols (1978); V.F. Ray, Cultural Relations in the Plateau of Northwestern America (1939).